MEXICO CITY (CNS) -- The Mexican government apologized after federal police burst into a parish and interrupted Mass in the western state of Michoacan to apprehend a drug-cartel suspect. An Aug. 4 statement from the Secretariat of Public Security apologized to the Mexican bishops' conference, Bishop Miguel Patino Velazquez of Apatzingan, and the faithful "for the circumstances in which the operation had to be carried out." The statement said that the raid in an Apatzingan parish was undertaken to avoid gunfire and a "violent incident." The Aug. 1 raid resulted in the arrests of 33 alleged members of a cartel known as La Familia Michoacana and the seizure of cash, weapons, fragmentation grenades and luxury vehicles. The detainees include Miguel Beraza Villa -- known as "La Troca" (the Truck) -- a cartel lieutenant that Mexican and U.S. authorities allege was responsible for transporting tractor-trailers full of synthetic drugs such as "ice" and "crystal" from the cartel's clandestine laboratories to the United States via Tijuana, Mexico. The bishops' conference had criticized the raid as a show of disrespect for the sanctity of Mass. "We make an energetic protest against the lack of respect and the violence exercised on the part of the forces responsible for guaranteeing the security of all persons in our nation -- principally in the state of Michoacan -- by interrupting a religious act ... at the moment in which holy Mass is celebrated," the bishops said in an Aug. 3 statement signed by Auxiliary Bishop Jose Gonzalez Gonzalez of Guadalajara, conference secretary-general. "Nothing explains this kind of action inside a religious place and much less in these moments where Mexico is noted internationally as an insecure and violent country," the bishops said. The raid also highlighted the increasing vulnerability of church officials and the faithful of being caught up -- inadvertently or not -- in the ongoing federal crackdown on drug cartels. The raid continued a high-profile crackdown on drug traffickers in President Felipe Calderon's home state, where some 5,500 federal police and soldiers have been dispatched to fight organized crime. By the end of July, violence from organized crime had claimed more than 250 lives in Michoacan and more than 3,500 lives nationwide, according to the newspaper Reforma. Federal police, arriving in armored vehicles and accompanied by two Black Hawk helicopters, raided Our Lady of Perpetual Help Parish in Apatzingan Aug. 1, interrupting a Mass being celebrated in advance of a "quinceanera." Local media reported that an estimated 250 attendees and the priest -- identified as Father Vicente Soto by the Michoacan news agency Quadratin -- were held in the parish for six hours. Father Calvillo said police "took advantage of the Mass to assault a large number of 'narcos'" and avoid bloodshed, but showed ignorance of the importance of the Mass. Mexico's bishops, he added, "have rejected all types of protection or calls for arming themselves. It would be a false testimony." The U.S. Embassy in Mexico City and the U.S. Drug Enforcement Agency lauded the Aug. 1 arrests as key accomplishments in Calderon's battle against organized crime. 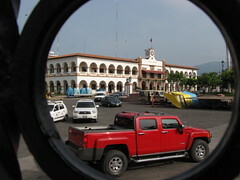 Security expert Pedro Isnardo de la Cruz of the National Autonomous University of Mexico said La Familia has shown a surprising resilience that "reflects poorly" on the president's war on organized crime, has demonstrated a "great ability to corrupt" local governments, and also appears to be receiving financing from unknown sources beyond Mexico.